In the aftermath of Hurricane Florence, Rev. John McLaughlin and the congregation of St. Jude’s MCC in Wilmington, North Carolina, USA, need your help. Trees and wires are down on their property and flooding has nearly isolated the city. Resources are dwindling, and in some cases, people are struggling to recover from this disaster. Pastor Vance Haywood from St. John’s MCC in Raleigh, North Carolina, USA, is coordinating relief. He is in frequent conversation with Rev. McLaughlin, and together, they have created a list of needs. Pastor Haywood said St. John’s has set up a major section of their facility to function as a sorting and storage area for relief donations. They have numerous partners willing to help deliver the items to Wilmington since access is difficult. At this time, he said supplies will need to be flown in until the roads become drivable. Because electricity has not been fully restored in Wilmington, Pastor Haywood said St. John’s will accept financial donations and supplies and distribute them to St. Jude’s. He added that 100% of the donations will go directly to those impacted. 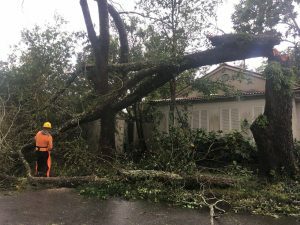 Additionally, St. Jude’s Food Pantry has been completely wiped out; they have handed out all that they had and lost some food due to the storm. Your donations will not only help the pastor and congregation but also the community. Donations can be delivered to St. John’s. The address is below. If you would like to donate items that require refrigeration, please call Pastor Haywood first. His cell number is also below. Thank you for your generosity. May our prayers and assistance be abundant and reach those who need our help.